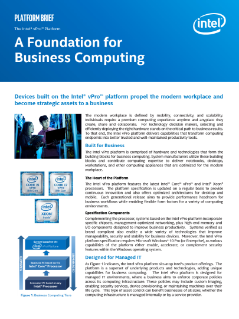 Devices built on the Intel® vPro™ platform enable digital transformation and become strategic assets to a business. Intel defines digital transformation as the strategic application of technology in order to improve business operations. To that end, the Intel® vPro™ platform delivers capabilities that transform computing endpoints into better trusted and well-maintained productivity tools. Intel® Setup and Configuration Software 9.0 saves time and money with remote PC management. Processes, configurations, and set-ups for software developers provisioning systems with Intel® AMT. Intel® Setup and Configuration Software helps manage enterprise IT and configure policies.